A brief synopsis – When Robert California drunkenly closes the Binghamton branch, other branches, and Andy fight for the remaining clients. Pam is forced to figure out what Robert said to Nellie on a voice mail, along with Angela, Gabe, etc. Sadly, now Nellie thinks she has an office friend in Pam. Andy gets together with David Wallace…seemingly inevitably. 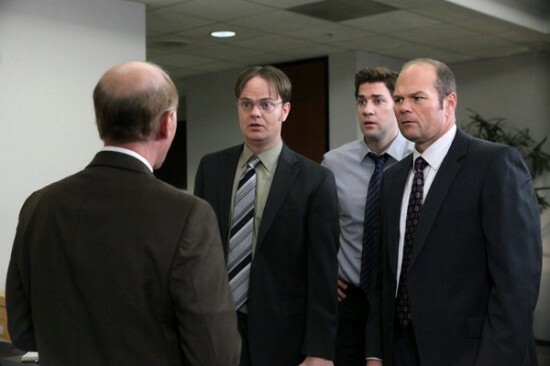 The best line – Harry (from Syracuse branch): Where the hell are Jim Halpert and Dwight Schrute? Erin, turning to Jim and Dwight: Jim, Dwight, what are your last names? 2nd best line – Andy: My wireless password is “EatPrayLove.” Easy to remember. 3rd best line – Jim: The salesmen have a commission cap, but we’ve figured out a way around it. Dwight: Lloyd Gross is a fictional salesman we invented to, how do I put this, steal from the company. Embezzle. To commit fraud. Jim: Okay, it sounds sketchy, but, it helps us get more money. The best moment – Andy making a big flaming pile of cherries jubilee over homemade gelato for the office. The best story line – Andy, gaining traction with David Wallace. Good episode that could be great. Bauer is an excellent change of pace to Tate. It’s a nice idea and consistent with the character to have California start to bring the company down before he makes his exit. Bringing Wallace back is another stroke of brilliance and a good change of pace to see him interact with Andy differently than he would with Michael. It’s still a little awkward, but not stupidly so. Jim and Dwight working together and creating Lloyd Gross to get more money is a true extension for both. I enjoy this episode much more for what it bodes for the future as compared to what happens.